I’ve always loved little jobs that can adapt a piece of clothing or improve it. I’ve adjusted knitwear in the past to narrow it, as well as put darts in shirts, and it’s probably the reason I love polishing shoes so much. One task I perfected recently was stretching the sleeves of sweaters. Most knitwear is too baggy for me – or anyone in even half-decent shape. I often end up buying a size too small so it’s fits in the waist, and compromise on the sleeve length. This isn’t too bad if you have a shirt underneath it, to take up the last inch or so. However, it is possible to stretch the sleeves to the perfect length. The key is to start conservatively, so that there is no risk of overstretching or deforming them. Place the sweater on a table, spray it on both sides with water until moist, then stretch it with your hand and hold for a minute or two before releasing. There are three variables here: saturation, stretch and time, each of which you should take a cautious approach to at the start. After much experimentation, I found that my mid-weight cashmeres from Loro Piana and Johnston’s lengthened by an inch if I stretched each sleeve by five inches and held them for two minutes. But if you are unsure at all about the material, start more conservatively. Softer, lighter and more open-weave wools will stretch more. Initially, the sleeve will look as if it has stretched a lot, but it will gradually shrink as it dries. Leave it for a long time – preferably overnight – before trying the length. As with washing a sweater, the best way to dry it is to roll it up in a towel and then place it on a rack, so air can circulate all around it. The same trick can work with the length of a sweater’s body, but it is very hard to avoid distorting the shape. You can follow the discussion on How to stretch a sweater by entering your email address in the box below. You will then receive an email every time a new comment is added. These will also contain a link to a page where you can stop the alerts, and remove all of your related data from the site. In a comment or an article here a while ago (I forget when and where) you mentioned a few projects that were in the works. One was bespoke casual wear, and your G&H leather jacket is I think what you were talking about there, but another project that you mentioned was bespoke knitwear. Did that ever go anywhere? I have the same problem as you, most knitwear is far too baggy on me and being small (36.5″ chest) I get few opportunities to size down as you do since that needs a manufacturer that offers XS sizes; they are few and far between in my experience. P.S. Did I see you get on a District line tube train to Richmond last Friday (early afternoon)? Bespoke knitwear hasn’t really taken off – the Dartmoors and A&S knitwear have filled the gap, as they are great slim fits. I am exploring bespoke knitwear with A&S though, through their Italian supplier. You made my week with this post. I have gorilla arms, which gave me an advantage in boxing but forced me in the past to purchase oversize XL knitwear. This is superb. Gold star, sir. I often have the problem of sweaters stretching out. When I get a size medium they usually fit very well, and a small is too small. But after a season or two the sweater stretches out, mostly becoming baggy in the body. Do you every have luck with shrinking sweaters back to their original size? I don’t wash mine that often. I will try washing the one that has stretched the most out of shape and dry it flat. Thanks! If they’ve become so baggy as to be unwearable then have you ever tried the “nothing to lose” last resort solution of doing what most people say never to do and tumble drying them to see if that shrinks them back to an acceptable fit? If they’ve got so baggy as to be only good for throwing in the bin or donating to a charity shop then it’s always worth a try. When and where will satriano cinque be in London this month? This Friday and Saturday morning, at Holland & Sherry. Check out their Google+ page for contact details. I will also suggest that they post details of all future visits there. Thx simon. What are their prices currently? €180 for a shirt I believe. Covers most cloths. Just talked to Luca and he said he will put future dates on Google+. Do you think this might work for a merino top that…um…went through a hotter wash than it should? 1. Is it possible to shrink a cashmere sweater safely and without damaging the yarn? 2. Any advice on altering overcoats? Particularly waterproof coats such as Barbour or Aqauscutum and retaining their waterproofing. Barbour themselves won’t alter the chest size of their jackets claiming its not possible – though there is plenty of evidence online to suggest otherwise. Should one shrink them in the wash instead of being tailored? On resizing them should they be a size up from your suit coat size? So if one takes a OTR 40R suit then one should buy a 42R overcoat? 1. Yes. That’s what I’m suggesting. 2. It’s tricky. Any tailor can take in the side seams, but those might then have to be taped up, or coated in a glue that runs into the stitch holes. Whatever system the coat uses to prevent water going in through the seams, essentially. If you’re not bothered about that, that’s fine. There are lots of reasons a RTW producer might not want to adjust a jacket. The above on waterproofing; treatments that change the colour, so the adjusted area would look odd; changing the balance of that jacket, e.g. position of pockets. Most raincoats are sized to fit over a suit. So buy the same size. I usually get raglan-sleeve ones so I can get a smaller size, to be slimmer in the waist. Wow, this information was GREAT! Revolutionary for us, dare I say! 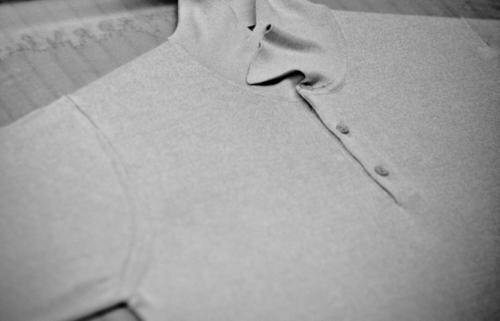 Finally a little insight on what to do for those pesky, short sleeves on all our knit wear! Thanks for the great posts and the stylespiration! Definitely gonna start following! check out our marketplace if you get the chance, Thanks. is possible to stretch a wool sweater? Unfortunately it become to small on the waist and in the sleeves width. Yes, to a certain extent. Have you tried the steps in this post? Good tip. Do you think the same approach would work for pique cotton? I have a 100% acrylic muscle fit jumper that is too tight across my chest. Is there any way of my stretching the chest without doing so to the rest of the jumper.